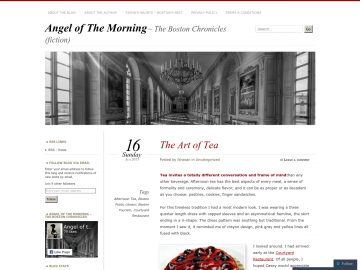 Angel of the morning is a piece of serialized fiction that follow the day-to-day life of rich, sophisticated urbanite, Natasha Rehman as she explores Boston most interesting museums, restaurants and shopping. Follow Natasha and her gang of colorful, affluent and definitely eccentric friends on a tour of Boston you won’t get in the guide books. Angel of the Morning has not been tagged yet. Help others find Angel of the Morning by tagging it! Angel of the Morning has not been reviewed yet. Angel of the Morning has not been recommended yet.